The paper introduces the Baanashada Dumarka, a Somali fertility therapy carried out by a spirit medium, known locally as ‘Alaqad. Baanashada is aimed at women whose fertility issues are believed to be caused by spirits. The study also explores a component of the Baanashada, namely, the use of tiire (Rotheca myricoides), or the butterfly bush. 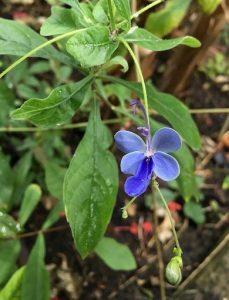 Although Rotheca myricoides is known to possess a number of medicinal components as confirmed by studies of modern science, so far, there exist no studies on its potential (or lack of) fertility effects. Hence, the alleged fertility benefits of the butterfly bush need examining. The author is aware of at least one recent case that a Somali woman from Europe died of herbs placed in her cervix by a traditional healer in Somaliland. This piece of information indicated not only the role of herbal medicine in fertility practices, but also the popularity of traditional reproductive medicine beyond border, class or educational background. Yet, current research into Somali women’s health focuses mainly on Female Genital Mutilation (FGM), examined often without the context of wider cultural practices. This paper, however, suggests that rituals, beliefs and material culture play a paramount role in women’s practices. For example, as explored elsewhere, the wagar, a wooden and sacred object made of the African olive, is critical for fertility practices. The current paper illuminates further the significance of reproduction practices in Somali society and the potential continuity of traditions associated with the perpetuation of kinship. It concludes that fertility rituals are part of a wider context of interaction with sacred landscapes, objects and archaeological sites, often associated with past legends in the Horn of Africa. OPEN ACCESS Mire & S (2016), ‘The child that tiire doesn’t give you, God won’t give you either.’ The role of Rotheca myricoides in Somali fertility practices, Anthropology and Medicine 23(3): 311-331.